Five international UN Volunteers serving as midwives with the United Nations Population Fund (UNFPA) in South Sudan, but currently on evacuation in Kenya, celebrated the International Day of the Girl Child by visiting a school in a slum settlement in Nairobi. UN Volunteers Roselyn Owour, Epher Welavunuka, Petronila Khagai, Anne Munene and Jennifer Kibicho held a sensitization session with school girls to raise awareness about gender equality, the importance of going to school and not missing classes, and the challenges facing girls around the world. The school - World Hope Academy in the Kawangware slum in Nairobi - has a total student capacity of 400 children, most of them coming from poor families that live in the slums. In many countries, when girls are in their menses sometimes they stay at home, thus missing out on class work. If girls do not have sanitary towels, focussing on their class work becomes very difficult. Donating sanitary pads can make a world of difference since many girls and their parents cannot afford them. During the activity in the school, Roselyn Owour read the Day’s statement from the UNFPA Executive Director, Mr Babatude Osotimehin. 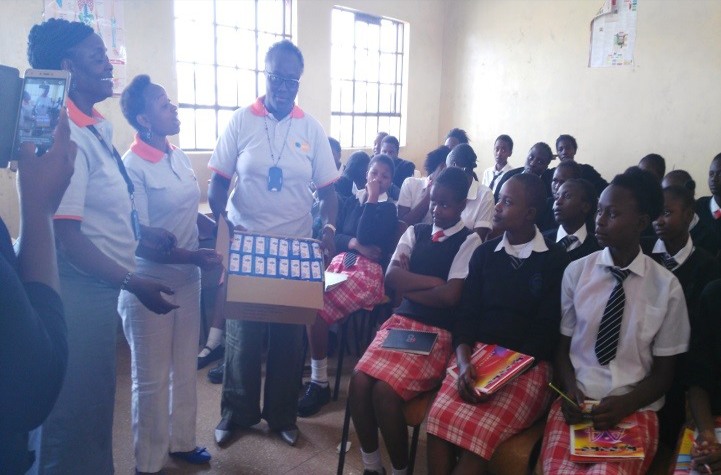 Anne Munene and Jennifer Kibicho gave highlights on personal hygiene in relation to menstruation as a way of keeping the girls in school, and informed them about volunteerism. The girls were very interested in the topics and wanted to hear more. They had many questions about sexual reproductive health, and the volunteers promised them to liaise with the school management and the UNFPA and United Nations Volunteers (UNV) programme offices to provide formal sessions on this subject. The girls and the school management appreciated the donation of sanitary towels, and the volunteers will look into ways of making this gesture sustainable.